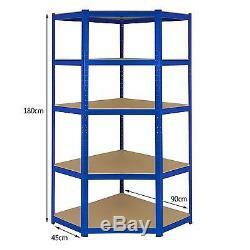 1 x Corner Racking Garage Shelving 4 x 90cm Bays Metal Heavy Duty MDF Shelves. 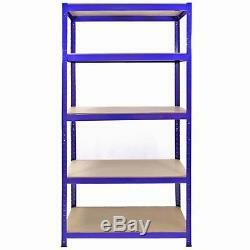 This sale is for 1 x Blue T-Rax corner shelving unit and 2 x Blue T-Rax shelving units / garage racking / warehouse racking / garage shelving from the T-Rax range. 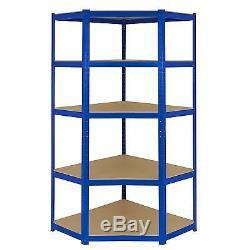 1 x T-Rax corner storage rack - Dimensions 900mm x 450mm x 1800mm. 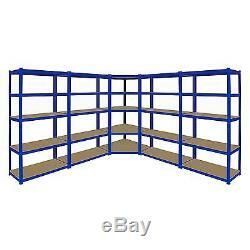 4 x T-Rax Racking units rack - Dimensions 900mm x 450mm x 1800mm. 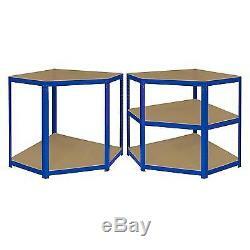 All units - including corner racks - can be split into two halves effectively creating two superb workbenches. 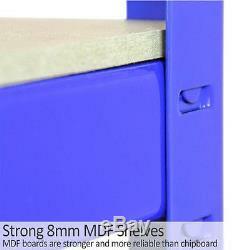 Solid MDF boards for all shelves. Moulded feet providing extra sturdiness. Massive weight tolerance of 280kg per shelf (T-Rax shelving unit) & 265kg per shelf (T-Rax corner unit) of evenly distributed weight. Giving this bundle a combined weight capacity of 6925kg - that's over 6 tonnes! Heavy duty 1.2mm thick steel. Can be added to other T-Rax designs to create larger storage units. To assemble these, all you will need is the FREE rubber mallet - no bolts required! Corner Depth (front to back) 95cm. UK Mainland orders placed by 2pm are dispatched on the same day. Orders placed after 2pm Friday will be despatched on the Monday. Scottish Highlands, Channel Islands and Ireland. The 30 days start from the day after you receive the goods. Monster House, Alan Farnaby Way, Sheriff Hutton Industrial Estate, Sheriff Hutton, York, YO60 6PG.  1 x T-Rax corner storage rack - Dimensions 900mm x 450mm x 1800mm  4 x T-Rax Racking units rack - Dimensions 900mm x 450mm x 1800mm  All units - including corner racks - can be split into two halves effectively creating two superb workbenches Solid MDF boards for all shelves Moulded feet providing extra sturdiness Massive weight tolerance of 280kg per shelf (T-Rax shelving unit) & 265kg per shelf (T-Rax corner unit) of evenly distributed weight  Giving this bundle a combined weight capacity of 6925kg - that's over 6 tonnes!  Heavy duty 1.2mm thick steel  Can be added to other T-Rax designs to create larger storage units  To assemble these, all you will need is the FREE rubber mallet - no bolts required! 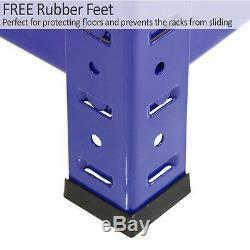 Dimensions:  Height 180cm  Corner Depth (front to back) 95cm  Width (widest points) 126cm  Width (front) 63cm  Depth (shortest side) 45cm  Depth (longest side) 90cm Product Specs Brand: Monster RackingManufacturer: MonsterShopWidth: 90cmHeight: 180cmDepth: 45cmColour: Blue Get In Touch! --- --- --- --- Monster House, Alan Farnaby Way, Sheriff Hutton Industrial Estate, Sheriff Hutton, York, YO60 6PG. 1 x T-Rax corner storage rack - Dimensions 900mm x 450mm x 1800mm 4 x T-Rax Racking units rack - Dimensions 900mm x 450mm x 1800mm All units - including corner racks - can be split into two halves effectively creating two superb workbenches Solid MDF boards for all shelves Moulded feet providing extra sturdiness Massive weight tolerance of 280kg per shelf (T-Rax shelving unit) & 265kg per shelf (T-Rax corner unit) of evenly distributed weight Giving this bundle a combined weight capacity of 6925kg - that's over 6 tonnes! 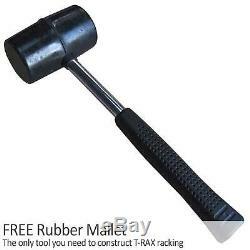 Heavy duty 1.2mm thick steel Can be added to other T-Rax designs to create larger storage units To assemble these, all you will need is the FREE rubber mallet - no bolts required! Dimensions: Height 180cm Corner Depth (front to back) 95cm Width (widest points) 126cm Width (front) 63cm Depth (shortest side) 45cm Depth (longest side) 90cm. 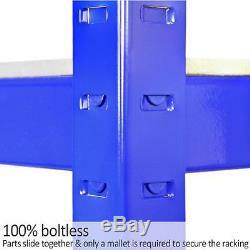 Product Specs Brand: Monster RackingManufacturer: MonsterShopWidth: 90cmHeight: 180cmDepth: 45cmColour: Blue. 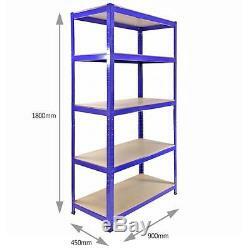 The item "1 x Corner Racking Garage Shelving 4 x 90cm Bays Metal Heavy Duty MDF Shelves" is in sale since Tuesday, March 1, 2016. This item is in the category "Business, Office & Industrial\Retail & Shop Fitting\Shelving & Racking". 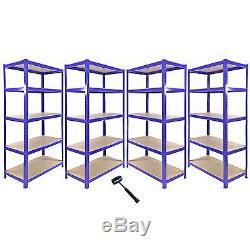 The seller is "monster_racking" and is located in York YO60.